When has Eva Longoria baby's born? All the details here! 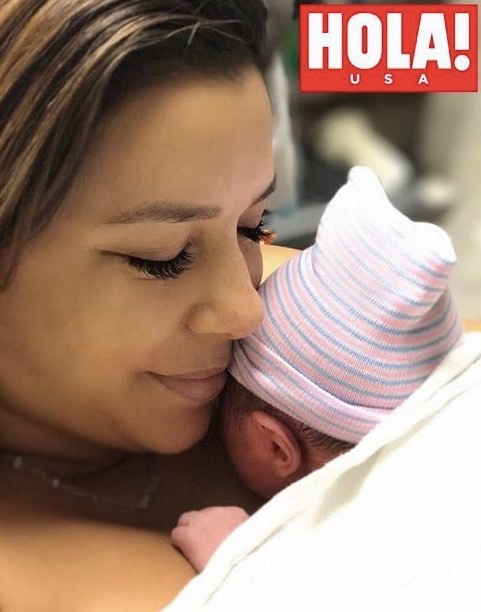 Eva Longoria has given birth to a baby son - her first child at the age of 43. The Global Gift Foundation co-owner and Hollywood famous actress celebrated on Tuesday, June 19, in Los Angeles with her husband Jose 'Pepe' Baston welcomed their little boy after Eva confirmed her pregnancy in December 2017. The new mom and her husband José Bastón shared today to a US online magazine 'HOLA USA' what is known as the first photo of their baby. In the lovely photo, we can see Eva Longoria with a content smile cradling her newborn baby, while this rests on her chest. While Santiago's face can't be really seen on the photo as he nestles into his mother's chest, we can definitely see his tiny hand peeping out from under a white blanket and wearing a striped hat on his head. The name chosen for the baby boy is Santiago Enrique Bastón, the couple welcomed their first child together on Tuesday, June 19, in Los Angeles. According to the details from the recent new, Eva, at 43 years gave birth at Cedars-Sinai Medical Centre in Los Angeles and Santiago weighed 6lb 13oz. Eva and Pepe shared the news adding "We are so grateful for this beautiful blessing." The baby was born after over two years after their lavish wedding held in Mexico. In recent news sadly Eva lost her beloved puppy Jinxy, she shared on Instagram an emotive message in where she was cradling the fluffy white pup in her arms, Eva wrote: "So the day I’ve been dreading happened last night. Eva Longoria and her puppy Jinxy, She wrote in a message ''"He will be missed by many. I love you Jinxy." "Jinxy passed away in my arms at the vet. He had a stroke that he just couldn’t come back from. "He was 15 years old (96 in dog years) and he filled those years with lots of love and laughter. "He was my baby before this baby in my belly came along. Eva has been updating all her fans throughout her pregnancy time in social media Instagram an revealed that how excited she was awaiting the arrival of her bundle of joy. Eva took good care of her pregnancy since we could see her working and exercising routine. Over the last nine months of her pregnancy. The new mom was also premiered for her new film Overboard and received her star on the Hollywood Walk of Fame. Eva Longoria and José Bastón got married in Mexico in May 2016, five months after they announced their engagement, they had been dating since 2013. The couple moved back in March into a mansion located in Bel Air Crest, which is where she and her husband will raise their son. Congratulations Eva Longoria and José Bastón on your new baby!